Stir together salt and remaining flour in a large bowl, then stir in egg and yeast mixture to form a dough. Turn out dough onto a well-floured surface and turn to coat with flour, then knead until smooth and elastic, about 5 minutes. Form into a ball and dust with flour. Let dough rest in a bowl, covered with plastic wrap, punching down with a wet fist every hour, for at least 2 hours and up to 3. Preheat oven to 500° F with rack in middle. Turn out dough onto floured pizza pan, turning to coat, then flatten with your fingers into a 7-inch disk. Toss together cheeses and press into a compact 3-inch ball with your hands. 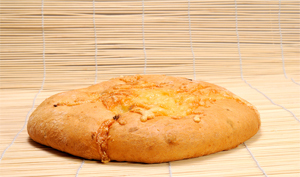 Place ball in middle of dough, then gather dough up around ball of cheese, squeezing excess dough into a topknot. Press down on topknot with a damp fist to press cheese out from center. Continue to flatten dough and distribute cheese evenly,pressing outward from center, until dough is an 11-inch disk. Cut a 6-inch X through top of dough to expose cheese. Bake until pale golden, 10 to 12 minutes. Brush surface of dough with butter and bake until golden and cooked through, 3 to 5 minutes more. Cook’s Note: Dough can be made 1 day ahead and chilled in bowl (for a slow rise), covered with plastic wrap. Punch down and bring to room temperature before proceeding with recipe.